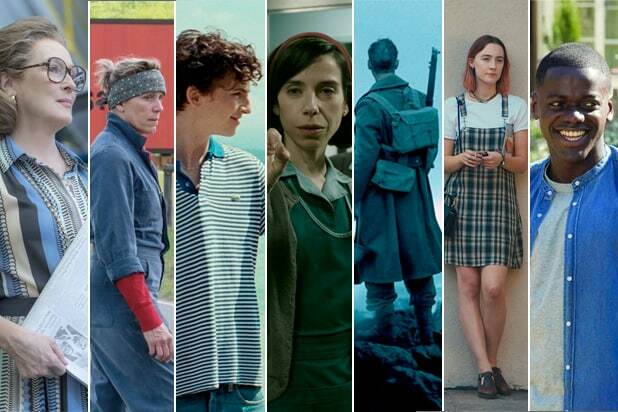 BEST PICTURE Nominees: "Call Me by Your Name" "Darkest Hour" "Dunkirk" "Get Out" "Lady Bird" "Phantom Thread""The Post" "The Shape of Water" "Three Billboards Outside Ebbing, Missouri" "The Shape of Water" has the most nominations, 13. It won the Producers Guild and Directors Guild awards. It's a valentine to the art of cinema. 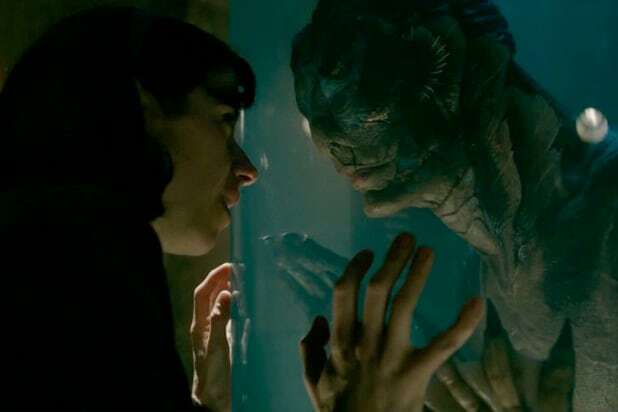 Predicted winner: "The Shape of Water"
BEST ADAPTED SCREENPLAYNominees:"Call Me by Your Name""The Disaster Artist""Logan""Molly's Game""Mudbound" While voters occasionally decide that the best screenplay is the one with the most words, which would be good news for Aaron Sorkin and "Molly's Game," nothing seems positioned to challenge James Ivory's adaptation of the Andre Aciman novel. Predicted Winner: "Call Me by Your Name"
BEST ORIGINAL SCREENPLAY Nominees: "The Big Sick" "Get Out" "Lady Bird" "The Shape of Water" "Three Billboards Outside Ebbing, Missouri" This is likely a very close race between "Three Billboards" and "Get Out" -- and while Jordan Peele wrote the year's most zeitgeisty movie and could easily win, "Three Billboards" is a showier piece of writing. Predicted winner: "Three Billboards Outside Ebbing, Missouri"
BEST CINEMATOGRAPHY Nominees: "Blade Runner 2049" "Darkest Hour" "Dunkirk" "Mudbound" "The Shape of Water" "Blade Runner" DP Roger Deakins, a pretty unanimous choice as the greatest living cinematographer, has been nominated 13 previous times but has never won, and his astounding work on the Denis Villeneuve epic ought to finally do the trick. Predicted winner: "Blade Runner 2049"
BEST FILM EDITING Nominees: "Baby Driver" "Dunkirk" "I, Tonya" "The Shape of Water" "Three Billboards Outside Ebbing, Missouri" "Baby Driver" is such a virtuoso piece of fast-paced editing that it could well prove an exception to the usual rule that you need to be a Best Picture nominee to win in this category. But "Dunkirk," which simultaneously cuts between three different war stories taking place at different locations and different times, is an advertisement for its editing. Predicted winner: "Dunkirk"
BEST COSTUME DESIGN Nominees: "Beauty and the Beast" "Darkest Hour" "Phantom Thread" "The Shape of Water" "Victoria & Abdul" It was a shock when the Costume Designers Guild gave its period-costumes award not to "Phantom Thread," the movie about a clothes designer, but to "The Shape of Water," most of whose characters sport lab coats or cleaning-lady smocks. But look for Oscar voters to recognize the movie in which the man makes the clothes and the clothes make the man ... and the women. Predicted winner: "Phantom Thread"
BEST PRODUCTION DESIGN Nominees: "Beauty and the Beast" "Blade Runner 2049" "Darkest Hour" "Dunkirk" "The Shape of Water" This should be a showdown between the amazing futurescapes of "Blade Runner" and the richly detailed environments of "The Shape of Water" -- and the fact that voters like the latter movie better than the former one could tip the scales. 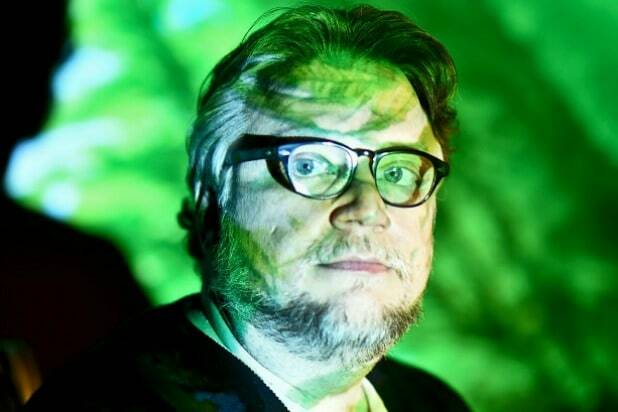 Predicted winner: "The Shape of Water"
BEST MAKEUP AND HAIRSTYLING Nominees: "Darkest Hour" "Victoria & Abdul" "Wonder" Here's another lock, because only one of these films features makeup that is instrumental in an Oscar-winning performance. Before Gary Oldman could act like Winston Churchill, he had to look like Winston Churchill, and that was the considerable accomplishment of the "Darkest Hour" makeup team. Predicted winner: "Darkest Hour"
BEST ORIGINAL SCORENominees: "Dunkirk" "Phantom Thread" "The Shape of Water" "Star Wars: The Last Jedi" "Three Billboards Outside Ebbing, Missouri" Voters love a piece of music that instantly captures the mood of a film they admire, and Alexandre Desplat provides that in his music for "The Shape of Water." Predicted winner: "The Shape of Water"
BEST ORIGINAL SONG Nominees: "Mighty River" from "Mudbound" "Mystery of Love" from "Call Me by Your Name" "Remember Me" from "Coco" "Stand Up for Something" from "Marshall" "This Is Me" from "The Greatest Showman" "Remember Me" is from a bigger movie but "This Is Me" is becoming a phenomenon at just the right time, which will probably give "City of Stars" writers Benj Pasek and Justin Paul their second consecutive song Oscar. Predicted winner: "The Greatest Showman"
BEST SOUND EDITING Nominees: "Baby Driver" "Blade Runner 2049" "Dunkirk" "The Shape of Water" "Star Wars: The Last Jedi" Two previous Christopher Nolan movies, "The Dark Knight" and "Inception," have won in this category, and his "Dunkirk" should have the scale and drama to give him a third. Predicted winner: "Dunkirk"
BEST SOUND MIXING Nominees: "Baby Driver" "Blade Runner 2049" "Dunkirk" "The Shape of Water" "Star Wars: The Last Jedi" Over the last 12 years, the same film has won in both Oscar sound categories eight times -- so when in doubt, it's best to predict a sound-category sweep. This year also lacks the kind of big musical nominee that often wins in the category, which will help "Dunkirk" in its quest to win another. Predicted winner: "Dunkirk"
BEST VISUAL EFFECTS Nominees: "Blade Runner 2049" "Guardians of the Galaxy Vol. 2" "Kong: Skull Island" "Star Wars: The Last Jedi" "War for the Planet of the Apes" The team for the "Apes" franchise has yet to win an Oscar for their visual effects work on the series, but we're guessing that voters will finally come to their senses and realize what an accomplishment the simian saga has been. Predicted winner: "War for the Planet of the Apes"
BEST ANIMATED FEATURE Nominees: "The Boss Baby" "The Breadwinner" "Coco" "Ferdinand" "Loving Vincent" Has "Coco" lost anything it's been nominated for this year? If so, I wasn't paying attention. Predicted winner: "Coco"
BEST FOREIGN-LANGUA GE FILM Nominees: "A Fantastic Woman," Chile "The Insult," Lebanon "Loveless," Russia "On Body and Soul," Hungary "The Square," Sweden In a very close race, we think the Euro-centric nature of the Academy's international membership may give the slightest of edges to "The Insult." Predicted winner: "The Insult"
BEST DOCUMENTARY FEATURE Nominees: "Abacus: Small Enough to Jail" "Faces Places" "Icarus" "Last Men in Aleppo" "Strong Island" With none of the four issue-oriented films really standing out, it's possible that the serious vote will split four ways and allow the beloved French icon Agnès Varda to become the oldest Oscar winner ever for her and co-director JR's wry and delightful travelogue "Faces Places." Predicted winner: "Faces Places"
BEST DOCUMENTARY SHORT SUBJECT Nominees: "Edith+Eddie" "Heaven Is a Traffic Jam on the 405" "Heroin(e)" "Knife Skills" "Traffic Stop" The two strongest contenders are "Heroin(e)," a wrenching but also inspiring look at the opioid crisis in West Virginia though the eyes of three women (a fire chief, a judge and a crusading volunteer) on the front lines, and "Edith+Eddie," a character study of the country's oldest biracial newlyweds that leaves viewers utterly infuriated at government indifference toward the elderly. Typically, the film that wins in this category is the film that leaves viewers with some hope, which could give "Heroin(e)" a tiny edge. Predicted winner: "Heroin(e)"
BEST ANIMATED SHORT FILM Nominees: "Dear Basketball" "Garden Party" "Lou" "Negative Space" "Revolting Rhymes" At the Oscar nominees luncheon, there was no bigger star in the room than Kobe Bryant, and nobody who posed for more selfies. And animator/director Glen Keane is a Disney vet almost as beloved in animation as Kobe is in basketball. Predicted winner: "Dear Basketball"
BEST LIVE ACTION SHORT FILM Nominees: "DeKalb Elementary" "The Eleven O'Clock" "My Nephew Emmett" "The Silent Child" "Watu Wote/All of Us" Three of the nominees -- "DeKalb Elementary," "My Nephew Emmett" and "Watu Wote" -- are exceptional, fact-based student films that could not be timelier: "DeKalb" deals with a shooter at an elementary school, "Emmett" with a horrifying episode that helped trigger the civil rights movement, "Watu Wote" with Christian/Muslim tensions. Predicted winner: "DeKalb Elementary"